July 4th this year means something different to me than if I had stayed in the U.S. I'm honored to be asked to visit the small but brave, Frisian harbor town of Harlingen which is about to present the Tall Ships Race of 2014. The photo below says it all. The foundation Harlingen Sail, the municipality of Harlingen and the province of Fryslân are hosting the race that involves several nearby countries. A feast for the eyes, it is also a training opportunity for many young sailors. The Ecoliner design by Dykstra Naval Architechts. Used by permission. Obviously northern Europe is leading the world in both traditional sailing ships and the modernization of sail cargo operation. It can happen in the U.S. and elsewhere, but perhaps the next place is the Mediterranean. This is the aim of SAIL MED, a new consortium organizing both traditional, small-scale cargo via clean wind energy along with future Ecoliners. See sailmed.org. Before and after our SAIL consortium meeting in Harlingen, dozens of sail cargo dreamers and practitioners will view the parade of 65 tall ships. 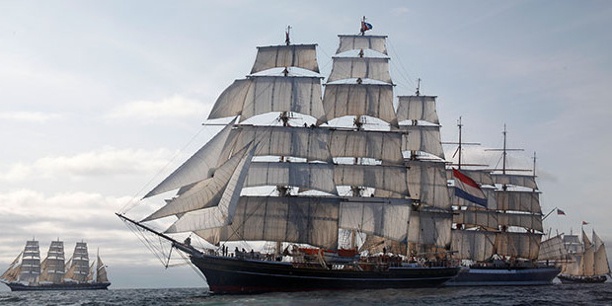 Holland has many traditional large sailing ships, such as the 100-foot, 100-year-old Bontekoe clipper (bontekoe.com). But most are shallow-draft, round-bottom vessels using dagger boards as substitute keels to manage shallow inland seas and myriad canals. When they are houseboats kids are even born on them. According to the Harlingen race website, the involvement of residents and business owners is substantial. Harlingen Sail and the local governments have created the largest nautical, freely accessible, event ever organized in Fryslân (Friesland). The programme includes, besides an impressive Sail In Parade on Thursday 3rd of July, a crew parade, great music performances, nautical markets, shanty choirs, street festivities and activities for children. From Thursday 3rd till Sunday 6th of July, Harlingen will show the world the potential greatness of a small harbour town. 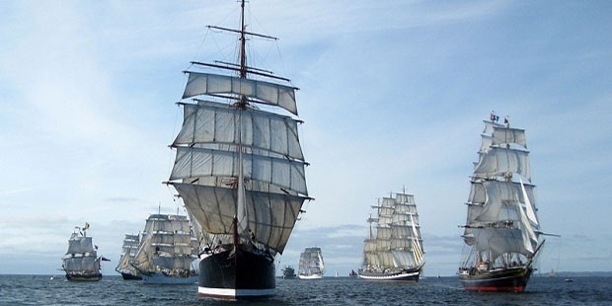 The 65 enlisted Tall Ships, originating from 15 countries, will ready themselves for the annual Tall Ships Races. On Sunday afternoon 6th of July the Sail Out Parade is planned, during which the ships will leave Harlingen to appear at the start of the race on Monday 7th of July. Harlingen, Fredrikstad, Bergen and Denmark are the guest ports of the races 2014. The race will lead the Tall Ships from Harlingen to Fredrikstad and Bergen in Norway and to Esbjerg in Denmark. On board of the participating ships over 1,500 young people will face the experience of a lifetime. The joining of young people, trainees between the age of 15 and 25, is the most important objective of The Tall Ships Races and the organizing authority Sail Training International. Tall ships are beautiful, but useful too. 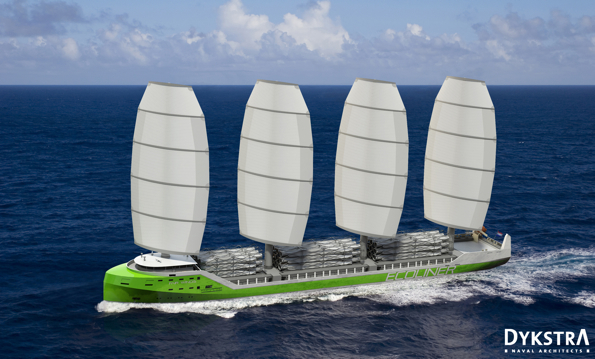 In the post-cheap oil world, free wind on sails is the solution for trade and travel without a carbon footprint. Coupling this awareness with modern technology, the Ecoliner breaks new ground. Our press release of this story emailed PDFs on next week's SAIL consortium meeting describes the project in words and pictures, with contact information. Please get in touch with SAIL or the Sail Transport Network (SailTransportNetwork.org) to learn how to contribute to today's future of sail transport! For more information on today's premier sail transporter, see Fair Transport's website and enjoy this picture of their flagship Tres Hombres.